Equity funds, also known as stock funds, are funds that are invested in the stock market. They are mainly classified by the criteria of the size of the corporation the funds are invested in. As the name suggests, large-cap equity funds are funds that are invested in companies with a large market capitalization and presence. These companies enjoy the possibility of steady growth and profits, which offers a security blanket of financial stability over a period of time. This investment is suitable for people who are looking for long-term capital appreciation. Large-cap funds tend to push mid-cap and small-cap funds out of the way. A growing company has the potential to become a huge player in the future. It adapts to market change and innovative trends quite quickly than a large-cap fund. They are less volatile when compared to small-cap funds. A word of caution is always given when investing in mid-cap funds. Mid-cap funds can be described as a 'cat on the wall'; it may either become a large-cap or just stay a mid-cap. So, the investor has to carefully consider all options and factors before investing in mid-cap funds. Their prices are significantly lower than large-cap and mid-cap funds. One can diversify their portfolio by investing in different small-cap funds. As the companies have just come out of their embryo stage, there is larger room for very notable developments. These funds are confined to a particular sector or theme - like pharma funds invest only in pharmaceutical companies. Thematic refers to companies that come within the scope of its subjects, such as media and publishing. But the risk of diversification is very high in thematic funds as the investor cannot go beyond the threshold of the theme. This fund invests in 65% equity assets and the remaining 35% in debt instruments. They provide lesser risk and automatic portfolio balancing when the markets are volatile. 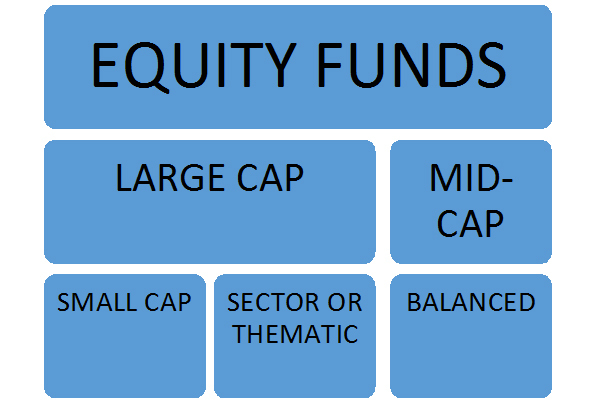 Dynamic equity funds are somewhat similar in nature to balanced equity funds as they also have a mix of equity assets and debt instruments, but it is not mandatory for these type of funds to have the same breakup like balanced funds. They can either invest in the given ratio or invest in a certain class of fund. Dynamic funds have higher risk potential when compared to balanced funds but they also carry the feature of higher returns. Dynamic funds change their portfolio based on the market standing. These funds were introduced in 2009 so that the Indian investor may access to more avenues for investing in funds. They have the option of investing in established and developing markets. Investing in equity fund has become a favored option in today’s state of affairs as people are looking for lucrative ways to increase their savings in order to better their lifestyle.